The last few days of scorching heat make it hard to believe it has barely been a month since we got a foot of snow. The Farmers Market is in full swing, getting a patio table requires hours of patience, and North Boulder Park is rife with picnickers. Most importantly, rosé season is finally here! Let’s make two things clear. First, I love hearty winter wines (Nebbiolo, Rhone blends, etc.) and by July I will be itching to break out the decanter for one of these. In fact, last year, a rainy spell in August was enough cause for me to break out a Barolo. Second, and more importantly, I am not talking about White Zinfandel. Below are my rankings for the best Boulder stores where one can purchase rosé wines. But first, a brief history. White Zinfandel, or “blush” as it is commonly called, is the evil twin of rosé. Frankly, calling it a twin at all is being generous, but they do, unfortunately, have effectively the same production method. When the juice is pressed from the grapes, both of these wines see the skins of the grape for several hours. The skins of the grapes impart the pink, salmon, and sometimes copper, color into the juice. In the case of White Zinfandel, early in the 1970s, Sutter Home experimented with fermenting the Zinfandel grape using white wine production methods. The brief exposure to the skins resulted in the pink color, however, during fermentation, the yeast became dormant (never a good sign) and resulted in a high level of residual sugar. The tasting room clientele was highly fond of the sweetness and Sutter Home began ramping up their production and eventually introduced their product into chain restaurants, where it again proved popular. While White Zin may possess a loyal following, it no doubt has many more critics. The black hole of negativity that White Zin created has proved challenging for rosé to escape from. From this point forward, I will not speak of, or refer to, White Zinfandel again. The last half decade in particular has seen rosé soar in reputation and quality in the United States. When I first started getting into wine in the mid-2000s, even the largest wine retailers only allocated a single shelf to the world of rosé. They also seemingly went out of their way to quarantine these wines next to the Franzia and other jug wines. Boulder has emerged from these dark times well before much of the US with numerous retailers who offer a diverse and exciting selection of rosé. Here I will profile the quality of rosé selection here in Boulder. Rosé is truly the wine for summer indulgences. It pairs well with pink meats (hot dogs and bbq pork), chicken, and can often stand up well to burgers. It also can compliment all but the stinkiest and most blue-veined of cheeses. However, it needs no food accompaniment to be enjoyed. Perhaps most importantly, it is best served chilled, ensuring maximum refreshment on a hot summer afternoon. Cured– Even though their wine space makes a dorm room look spacious, they have turned their south wall into the proclaimed “Wall of Pink” and without question offer the best selection of rosé relative to their total space. Will, one of Cured’s owners, has managed to stay well out ahead of the curve in selecting new producers, regions, and even grapes (Nebbiolo, Negroamaro, Zweigelt, etc). Over the last year, I have seen rosés appear at Cured months before restaurants or other retailers catch on to them. By the time these wines are in Vogue elsewhere in the city, Cured has often found a new and exciting pink wine to take its place. I suspect that Will’s time living in Europe has imparted a love of rosé that is on par with his adoration of charcuterie and fine cheese. Of the retailers listed, their rosés are the most expensive on average (typically $15-25) but I can rest assured that whatever I buy will be excellent and fun. Boulder Wine Merchant– When I went into the Boulder Wine Merchant, I was surprised to find their rosé selection to be somewhat limited, with only a few of each remaining (the recent scorching heat must have dried up their inventory?) However, the staff is knowledgeable about their selections and can confidently speak to each wine’s attributes. They also have a spectrum of price points, with many bottles being under $15, but being the BWM, I never have to worry about quality. They also are continuously adding new selections that never disappoint. Finally, if you are expecting a marathon picnic, are feeling generous to your guests, or are aiming for a theatrical element, they possess several Magnums. Liquor Mart– Liquor Mart easily boasts the largest selection of rosé in town, with well over 50 unique bottles. Most (>80%) of the bottles are good by my standards, having had many of them over the years, but there are a few that make me raise an eyebrow. Thus, unless you have dabbled a bit in the world of rosé, selecting a bottle is analogous to playing a game of Minesweeper. If you were expecting something dry (not sweet) and, say, chose a Moscato or Vinho Verde rosé, you would be disappointed. (At least in real Minesweeper you receive instant feedback!) And of course Yellowtail is always a no-win proposition. 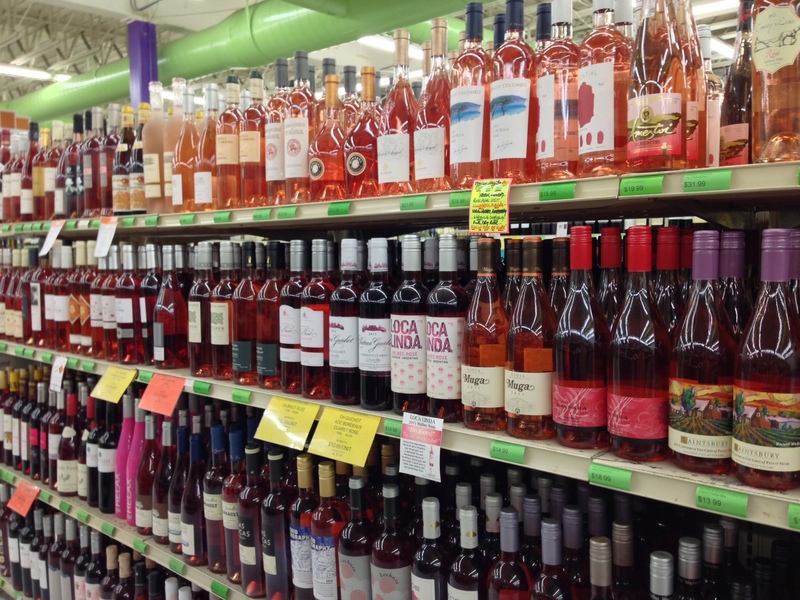 If Liquor Mart organized their rosé selections a bit more methodically, it would be an excellent place to go, until then, choose with some care. Or ask their staff for a recommendation; I’ve found many of their roaming staff members to be quite knowledgeable. Like a do-it-yourself treasure hunt! At least there are a few "shelf talkers." West End Wine Shop– At any one time, the West End rarely possesses more than ten or so choices of rosé, which is not surprising given the quaint space. Usually several Provencal varietals, a few American selections, and currently a Tavel. I find it always hard to know what to expect from American rosés, but their staff is genuinely eager to help you with a selection whether you want something bone-dry, or a bit sweeter. It would be nice to see a few more offerings, but they carefully choose all of their wines, so it is easy to select a bottle with aplomb. Hazel’s Beverage World– Hazel’s has about 40 different rosés on offer and most of their selections are pretty easily found at any larger retailer (ie Bieler Pere et Fils, Muga). As with all of their wines, if you don’t have their loyalty card, prepare to inexplicably pay a 20-30% premium. No question, they have many nice selections, but be prepared to fly solo though (maybe that is why they have a plane hanging from the ceiling?) The staff members I spoke with seemed to know nothing about their selections, let alone where they were located in the store. Finally, given my rant about White Zin above, you can imagine my response when I asked one of their roaming staff members to recommend a rosé and they directed me to a White Zin that was one of their best sellers. Yikes. North Boulder Liquor– It’s always a red flag to me when the rosé is relegated to the same shelf as the boxed wines, and also Saké in the case of North Boulder Liquor. They offer a few of usual suspects in the world of rosé, but little more. Between the location in the store, and the meager selection, it is clear that rosé is far from a priority for NBL. I’ll stick with NBL for purchasing Scotch. Thanks for the comment Juliet! No question (in my mind at least), Mateo leads the Boulder scene when it comes to restaurant rose. They even had a 4 course rose dinner a month or two ago where they offered La Spinetta’s rose, which was phenomenal. I don’t think that particularly bottle can be found anywhere in Colorado. The Med is great too- the combination of their lovely patio, delicious tapas, and a bottle of rose is hard to beat. They deserve a lot of credit in making rose more mainstream in Boulder. A couple of local restaurants are also in the know when it comes to rose. Both The Med and Mateo offer some delightful “pinks” at a variety of price points by the bottle and by the glass.